Some 500 disadvantaged families in the central provinces of Quang Nam, Quang Ngai, Binh Dinh, Phu Yen and Khanh Hoa have received financial aid worth a total of 25 billion VND (1.07 million USD) to build their own houses. The Vietnam National Shipping Lines (Vinalines)’s container shipping centre will be put into operation on December 17, said Vinalines Deputy General Director Do Thi Ngoc Trang. BIM Land Joint Stock Company, a member of diversified conglomerate BIM Group, was named Best Resort Developer Southeast Asia at the Dot Property Southeast Asia Awards 2018 held late last week in HCM City. 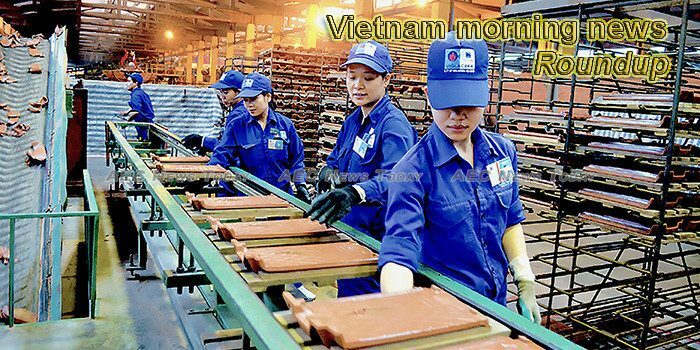 From a barren and arid land, the Chu Lai Open Economic Zone in the central province of Quang Nam has made itself a fertile area for industrial development, according to Prime Minister Nguyen Xuan Phuc. Young UK tourist Sean Williams chose Việt Nam for his first trip to Asia in November, and revelled in the country’s rich culture and cuisine. The HCM City Food Safety Management Board has set up 12 inspection teams to ensure food safety and hygiene during the Tet (Lunar New Year) holiday. Master planning has been a weakness for HCM City for a long time and it could persist, a HCM City official has said. A scientific seminar to offer strategic forecasts about the future of the Vietnamese digital economy took place in Hanoi on December 14. Vietnam’s Sun Group inaugurated the first five-star international boutique hotel Hotel de la Coupole – MGallery by Sofitel in Sa Pa resort district, the northern mountainous province of Lao Cai on December 15. The last time I was in Hanoi I felt frightened. As I was returning to my hotel late at night, and was about to cross the beautiful Ly Thai To street, dozens of roaring motorbikes suddenly emerged out of nowhere, thundering in front of me in a frantic and potentially lethal race. Coach Park Hang-seo of the Vietnam national football team on December 16 announced he will donate the 100,000 USD he was rewarded for charities activities in the host country. Winning the AFF Suzuki Cup 2018 has fetched the team the prize money of $300,000. But, given the popularity of the game and the team, business firms small and big have lined up to show their appreciation. A farming community in the central province of Quang Nam has been volunteering to protect a critically endangered troupe of gray-shanked douc langurs (pygathrix cinerea) that have made the area their home. The Ministry of Industry and Trade (MoIT) would increase supports to help local businesses improve their productivity thank to the training programme collaborated with Samsung Việt Nam, said Trương Thanh Hoài, the ministry’s head of the Industrial Department. Nguyen Thi Phuong Thao is in Bloomberg’s list of 50 people who’ve been business game changers in 2018. When discussing the most dynamic emerging markets globally, it’s hard to lose sight of Vietnam. Driving its strong economic growth is an expanding middle class with thickening wallets. Rapid urbanization supported by a young, growing and educated population all bode well for an economy with one of the world’s fastest growing GDP rates. In tackling violations by e-commerce firms related to low-quality goods and fake discounts, the opening of dedicated shopping websites is set to become an inevitable trend. Many restaurants in the Central Highlands province of Gia Lai are serving wild animals, but local authorities say it’s hard to deal with the problem. From her national costume inspired by a Vietnamese sandwich, to her English that made other candidates talking, Miss Vietnam H’Hen Nie has been among the trending candidates at this year’s Miss Universe pageant. The police in Long Bien District, Hanoi, announced that they had prosecuted Nguyen Duc Thang, born in 1989, for illegally trading human kidneys. Prime Minister Nguyen Xuan Phuc has issued a decision on establishing a national committee to prepare for Vietnam’s ASEAN chairmanship in 2020. Vietnam held the ASEAN Football Federation (AFF) Suzuki Cup trophy again after 10 years after beating Malaysia 1-0 in the second-leg final of the tournament that took place at My Dinh National Stadium, Hanoi, on December 15 night. Free heart disease screenings began on over 800 disadvantaged children under 16 years old in the Central Highlands province of Lam Dong on December 15. Đà Nẵng plans to build its first waste-to-energy project at Khánh Sơn dump. Kon Tum is calling for capable investors and firms to run long-term business in the Central Highlands province and accompany local authorities in developing the green economy, protecting the environment and combating climate change, a local official said. Young entrepreneurs and leaders from the ASEAN member nations and those from the Republic of Korea, Japan and China – the dialogue partner countries of the group, joined a discussion on experience, opportunities and challenges in hi-tech agriculture startups. Many environmentalists have raised concerns over the proposal to build a spiritual tourism site in Hà Nội’s Hương Sơn Commune which is home to Hương (Perfume) Pagoda. HCM City’s birth rate has remained low at 1.5 per woman in 2018. This week’s Vietnam morning news feature photo acknowledges International Migrants Day, December 18.